Turn that boring chicken dinner into one for the books. This Skillet Prosciutto Wrapped Chicken with Fresh Peaches is bursting with flavors that capture the sensation of summer. 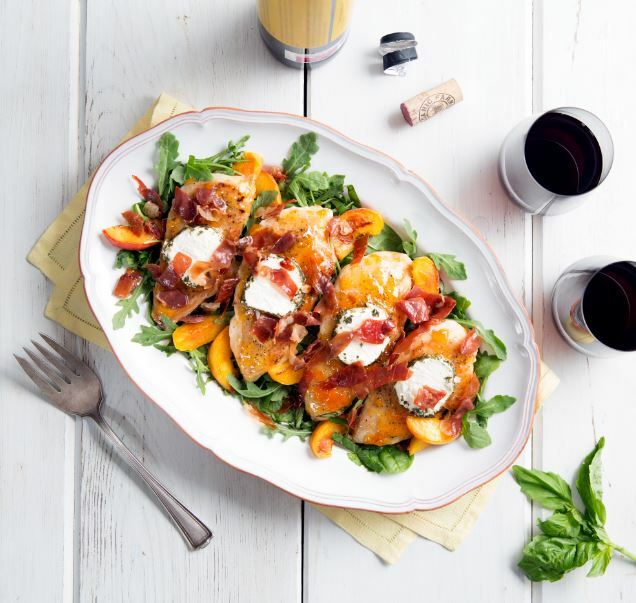 The creamy, herbed goat cheese complements the sweetness of the peach preserves, all of which are perfectly balanced by the savory prosciutto wrapped chicken. This dish is an easy go-to for hosting guests during a warm weather get-together, or to just enjoy for a quiet night in. Serve with a light side salad to round out the meal and of course pair with a classic wine, like a Burgundy or Spanish Reserva. In a large non-stick skillet over medium-high heat, cook prosciutto until crispy, about 5-7 minutes. Transfer to a plate. In same skillet, cook peach slices until just warmed and lightly browned, about 5 minutes; transfer to a plate. In same skillet heat olive oil. Season chicken with kosher salt, garlic powder and pepper and cook, top side down, until browned. Turn chicken and top with peach preserves and goat cheese, dividing evenly. Cover and cook over medium-high heat until chicken is cooked through and cheese is softened. Arrange arugula on a large platter. Top with chicken, prosciutto, peaches, and basil. Drizzle pan juices over platter.